car is now brighter, about steering I am no sure,it is already quite hard to drive no ? yup I saw that too (physic engine problem), I will update that when I will disable car flip-flop drive. Also whats stopping anyone from driving on the grass then the track? I don't see the grass slowing the car down atm. the grass dont slow the car for now but you have to compensate the slope, what about to make the grass sllicky ? any idea to make things funnier ? I would like a 'flip me back upright' key - space bar maybe? Funnier? Erm... Oil slicks that spin you round? Exploding boxes? Hedgehogs that make you jump? Check out Crash Bandicoot for ideas! I reckon guns/rockets/mines would be the best. That's why mario kart was so cool. The applet worked well on my computer. I agree that a flip-back-over button is needed, and maybe a few less jumps at the very start. happened to me where one of the car's wheels was stuck under the ground?! thanks, if you hardly hit something(box/wall) there is also a bug as the car become crazy. yes maybe, but not sure the lack of amusment come from the track geometry, I tried different road with different structure and that's not seem to be a lot more funnier exept for huge jump and looping wich are cool. good idea, Exploding box and the oil slicks. hehe would be cool, but I need to add network first. but rocket launcher will be definitly the best thing to add. to start I will add flip-back-over button, mine/exploding box and oil slicks. It's a really cool game. It's fun to play, but the track should be less boring. One Question: Why is the flag invisible from behind? you mean more object ? more jump ? Elevated rollercoaster-like tracks with (somtimes insane) jumps, computer controlled cars, have the car put back on the track if it falls off the track, maybe 1st person view. I also feel that if you turn fast in high speeds, the car should skid. thanks for all those idea, NB. : I dont find that 1st person view is so fun but in case of, it will be an option up to the player. the image joined is a fun accident I had while debugging tonight . I hope to have enought time to bring out a new demmo soon. 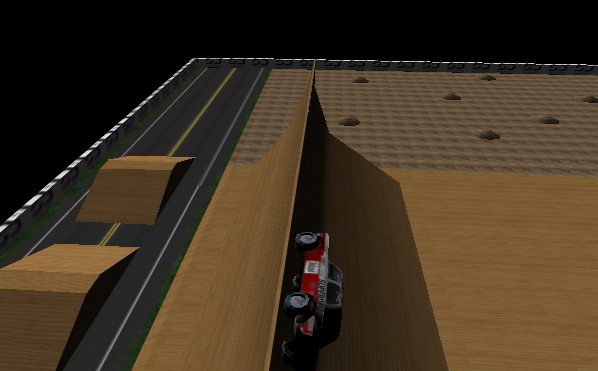 Hm I get this weird blitting in the middle of the screen and I can drive upside down. Maybe slow down the car, I think its too fast to control. maybe you are right, but I've tried it sooo much than I have a lot of training. Unfortunately I just can't play it - the controls are too sensitive; simply staying on the road is really difficult. Can you ease off the controls? I'd rather overshoot a corner than go off the road before I got to it! thanks for feedback, you are probably right as I am really an expert now for controlling this car, maybe slowing down a little the game speed will do the job ? (I already slow down speed from 10ms to 15ms step between logic from previous version as there was some feebacks it was too hard to play). Yah, too easy to get too good at your own game! Don't change the frame rate, change the turn delta for steering - I'd love to play around with the source code - uh, where is it? I'd love to play around with the source code - uh, where is it? The physics is a little strange; even with my changes, if you try going round the course slowly (like you were driving a real car) you'll see it behaves oddly, like there's no friction with the road? Also, when I go upside down I have to restart the applet! Good bit of software - ideal for testing these things! NB about the physics : the physic engine come from a very basic idea (kind of constrained sphere) but seems to magically respect a lot of physics law that I really never tought it will be able to, one interresting law it respect is the giroscopic effect of an object rotating in the air. software version works great, smooth and fast. Enjoyable controls and do like the shine on the car. Could be turned into a cool little game with a bit more effort and some goals. hardware version had problems running on my system, it starts but the car just flashes alot with missing polygons.